Officers from Humberside Police's proactive unit searched a property as they executed a warrant under the Misuse of Drugs Act today. The blank-firing pistol and ammunition found during a drugs raid in Bridlington. A blank-firing gun was found inside and seized, while four bottles filled with petrol were found hidden outside during further searches. 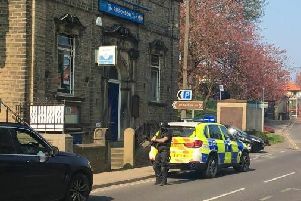 The force did not say where the property was located, but confirmed a 34-year-old man has been arrested on suspicion of possessing a firearm. Sergeant Mick McLaughlin said: “We always act on the information we are given and on the intelligence we gather to tackle crime of any sort in our force area. “I am glad we have recovered these items which could have possibly been used to create fear and alarm to an individual or community. “This arrest has been made in connection with intelligence we received regarding drugs activity. We now have an opportunity to speak with a man about that. Another warrant was executed at a property on Albion Street. Nobody was arrested but officers were said to have spoken to a man at the address and offered assistance. PC Rob Brigham, community beat manager for the Bridlington Neighbourhood Team, said: “I would like to thank people in Bridlington for their support regarding these warrants.